I wasn't sure what to expect going into this race. It's only been a few months since I strained my hamstring, so I didn't want to push my luck. 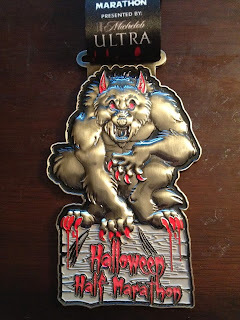 Plus, in less then 2 weeks, I will be running the Wine and Dine Half at Disney World. My primary goal was to not injure myself. Based on my last few runs, and my previous half marathon times, I decided I would shoot to finish right around 2:30. While not a PR (2:13) , it would be my fastest time since 2007. I felt confident I could pull it off, but I was not going to do anything to risk injuring myself. 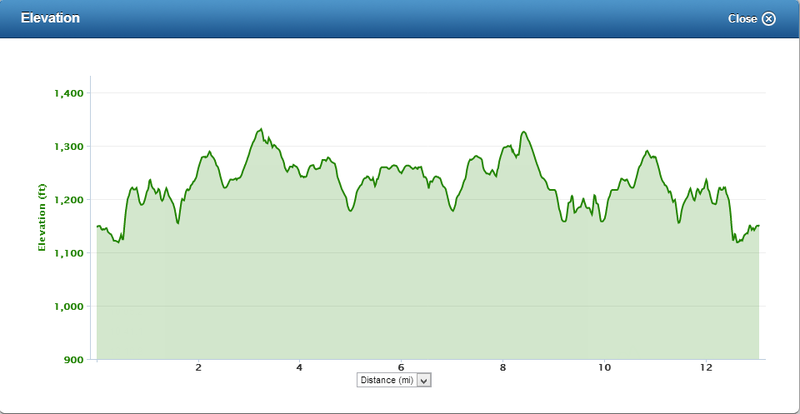 Having run parts of this course before, I knew it would be hilly, but manageable. The course map advertises the course as having 300 ft of elevation gain, but my garmin had over 900. 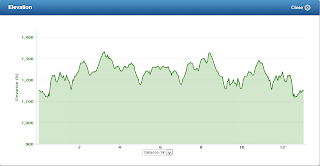 When you compare the 2 elevation charts, it looks like they smoothed it out and miss some of the downhill and going back uphill. Overall, the hills wouldn't bother me too much. There were just a couple where I decided that walking would be more productive. 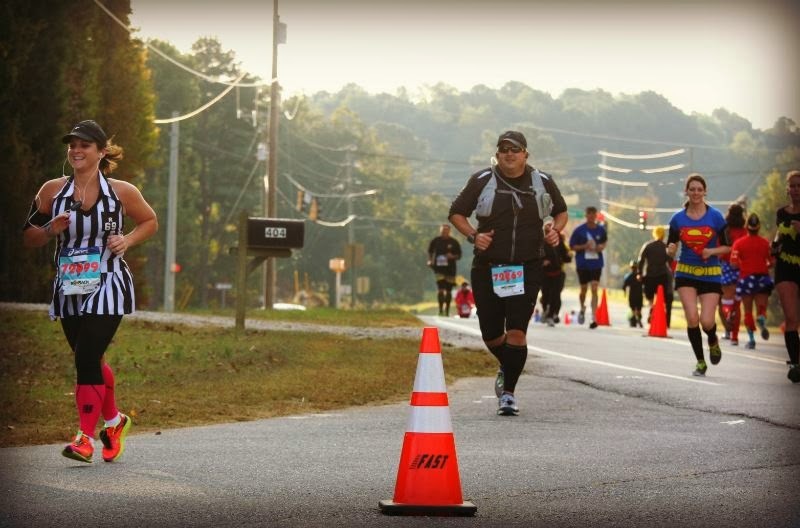 When the gun went off, I tried to hold back my pace as much as I could and let people pass me. I have a history of going out too fast and blowing up in the end, so I didn't want that to happen this time. 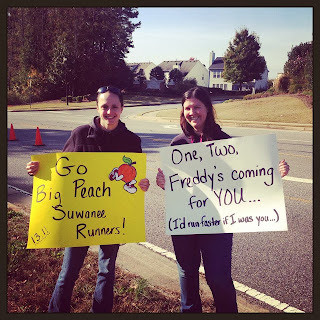 At around 1 1/2 miles in, I ran into blogger/twitter friends Jen and Ramona cheering on runners. There was almost no crowd support on the course, so it was nice to see a few friendly faces. I felt great for the first 5 miles, I was about 2 1/2 minutes ahead of schedule to finish in 2:30. The worst of the hills were in those first 5 miles, so I was confident in my ability to finish around my goal time. Little did I know that my GI system would sabotage this goal. Around mile 6, I met another twitter friend/blogger Jennifer who ran with me for a short while up to the next turn. At this point, I was feeling well, but a little concerned. The course description had mentioned a porta-potty stop around mile 4. I didn't remember specifically what mile it was supposed to be at while I was running, but once I passed mile 6, I knew there wouldn't be one. Based on my recent long training runs, I usually need to make a pit stop at some point during these long runs. Between mile 8 and 9, I felt that sensation all runners fear. I was afraid to play the game solid or gaseous, so I began to walk. By Mile 9, I was mostly walking. I ran when I could, but I was afraid I was going to have an accident. With about a mile and a half to go, I ran into Jen and Ramona again. This time they were handing out candy. I took a twizzler and kept on moving. I finished the race just short of 2:46. While 16 minutes over my goal, I still felt ok, because I knew I would have finished around 2:30 had I not have to walk the last 4-5 miles. While I wasn't happy with the lack of porta-potties on the course, I enjoyed the race and will probably do it again if it fits in my schedule. I reached out to the race director and he said they will address the porta potty issue next time. The tech shirt is nice and the medal is big and heavy. 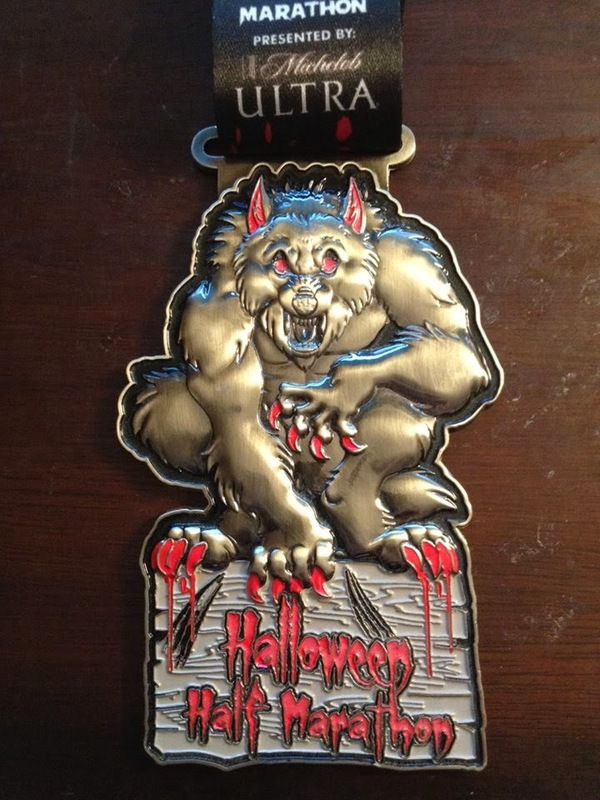 The red areas on the medal even glow in the dark. I am going to experiment with what I eat the night before and morning of a long run and see if I can avoid having to make a pit stop every time. Thanks for the shout out! So sorry you had issues...hopefully next year they'll have some porta-potties. Great job though...that was a tough course!